In 2014 there was an intense research conducted on women’s literacy in a low-income community in Mumbai, India. The research found that most women had dropped out of school by the time they had reached second grand, due to which they barely knew how to read and write. The research stated that due to this, women in the community would get fleeced in the market because they wouldn’t know how to tally bills. They had to be overly dependent on another family member with regards to money because they were incapable of opening a bank account. The group that conducted this research addressed this issue by executing a month-long workshop in the community, where they taught the women three things - how fill a bank form, how to sign their name and how to tally a bill. Quite good, right? You might think all of this was conducted by a group of social researchers, or an NGO working in the area of literacy. But you are wrong, all of this was conducted by children aged 11 to 14 who were part of the local community school. 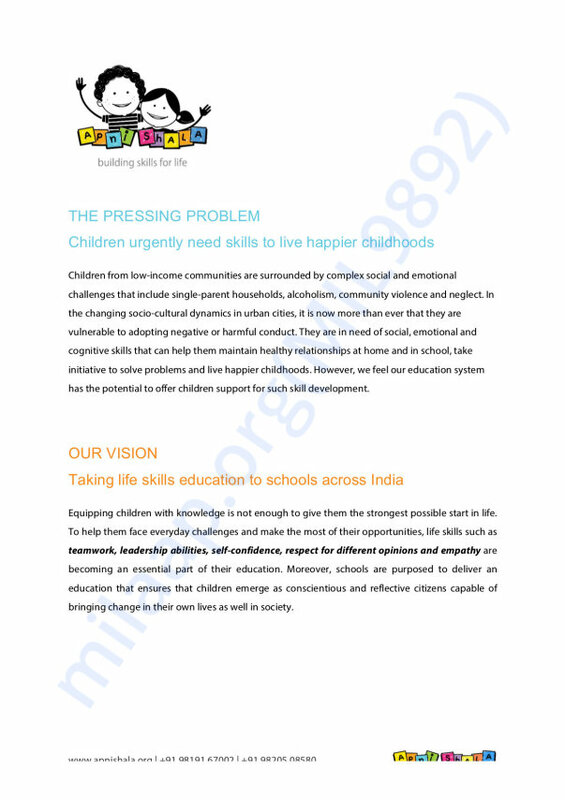 Apni Shala (Our School), the NGO that facilitated this entire programme, engages children in lightweight and interactive activities with the aim of building life skills. 2016 has been a year of many ups and downs, but I am trying to end it on a high and ring in 2017 on a positive note. I am trying to be a Secret Santa to 44 children that Apni Shala works with through this campaign. If, like me, you too believe that children can benefit from life skills education programmes, please support my campaign with a donation. Apni Shala in the News!